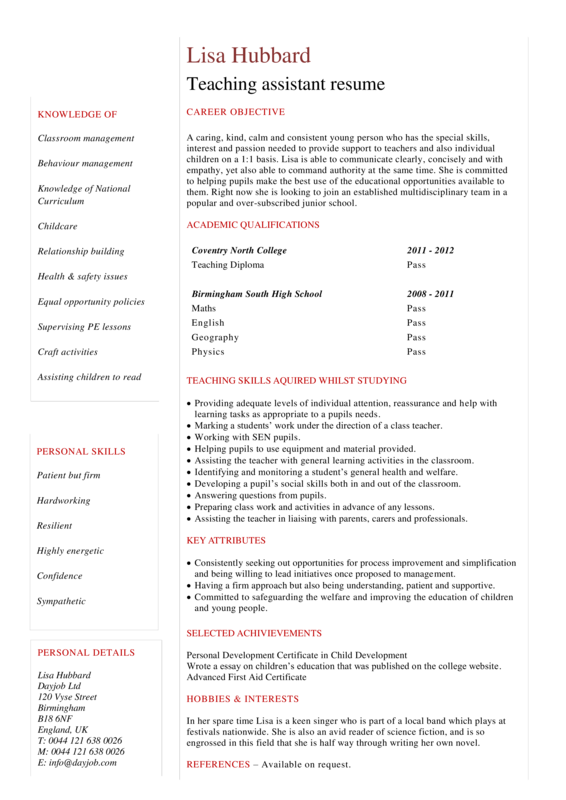 This Teacher Assistant Resume template will grab your future employer its attention. After downloading and filling in the blanks, you can customize every detail and appearance of your resume and finish. Completing your Teacher Assistant Resume has never been easier, and will be finished within in minutes... Download it now! Childcare ACADEMIC QUALIFICATIONS Behaviour management Relationship building College Teaching Diploma Pass Maths Pass English Pass Geography Pass Physics Pass Health safety issues Equal opportunity policies Supervising PE lessons Craft activities Assisting children to read PERSONAL SKILLS Patient but firm Hardworking Resilient TEACHING SKILLS ACQUIRED WHILST STUDYING  Providing adequate levels of individual attention, reassurance and help with learning tasks as appropriate to a pupil's needs..